On the other hand, my favorite was the Rock. It wasn’t just the fact that he had the best promo videos or the sweetest catchphrases (“Do you smell what The Rock is cooking?”), it was that he seemed to stand for something. Whereas Stone Cold and the hoodlums of DX stood only for drinking beer and swearing, the Rock stood for the People. He was, as he often said, the People’s Champion. His signature move**, far and away the “Most Electrifying Move in Sports Entertainment,” was the People’s Elbow (see video below). Did this dedication to the People at times clash with his use of the 3rd person when referring to himself? Yes. In retrospect, does the whole “People’s” thing seem more appropriate for communist China than for blue collar America? Yes. But I was twelve years old and such dissonance went largely unnoticed. Oh, I smelled what The Rock was cooking. And I liked it. The twelfth edition of the annual Survivor Series took place on Sunday, November 15th, 1998. In our house, this meant my dad shilled out $30 or so to order the special on Pay Per View so that his sons could watch the heavily choreographed and dramatized violence. At this time, the WWF Championship Belt had no owner, so this year’s Survivor Series was to be an elimination tournament to determine who would be the undisputed heavyweight champion of the world. Excitement in the Bobo household was high, helped in no small part by the copious amounts of Surge we had picked up at the 7-11 in preparation for the event. The Corporation’s favorite (i.e. the wrestler who, according to the script, was the guy Vince McMahon wanted to win it all) was Mick Foley, a/k/a Mankind, a bizarre and seemingly mentally unstable submission specialist whose signature move, the Mandible Claw, entailed Mankind sticking a sock-covered hand into his opponent’s mouth and pressing down hard on the flesh beneath the tongue. Try it. It hurts. Now imagine doing that to another person. Like I said: bizarre. Over the course of three hours, several matches and a good deal of interference by the McMahon family, the stage was set for the title event. In one corner, the Corporation’s favorite: Mankind. In the other: the People’s Champion. Like I said before, I knew it was all fake, but I was freaking out at the thought of my favorite wrestler sticking it to the Man and winning it all for the People. There’s no shame in getting excited about a sporting event the outcome of which is predetermined: it’s not so different from cheering for World Cup soccer. The match itself was spectacular. It hit all the checkpoints for a classic WWF championship bout: numerous signature moves, the liberal use of supposedly-illegal foreign objects***, the complete destruction of the Spanish Announcers’ table and an unforgettable twist ending. You see, after thirty minutes of these two maniacs beating each other, Vince McMahon interfered at the end in order to secure victory for the guy he wanted to win. He secured victory for The Rock. It’s difficult to put into words just how shocking this about face was, not only for your then-twelve-year-old correspondent but for everyone watching. 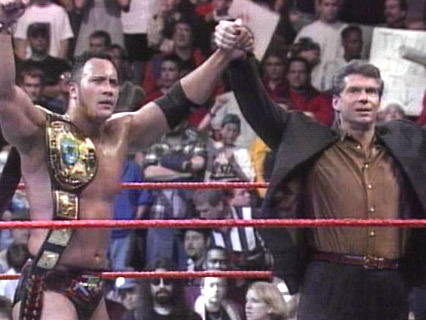 The Rock had always claimed to be the People’s Champion and he seemed to be proud of that (he was proud of himself in general, but still). Vince McMahon, despite obviously requiring the People to spend big bucks on Pay Per View events, made no secret of the fact that he “despised” the People. And we had just watched McMahon and The Rock team up to screw over Mankind and the People. How do we interpret this turn of events? How do you deal with your hero abandoning you when salvation seemed to be so painfully close? Should we just chalk it up to the fact that it was simply the most interesting twist that the writers could add to the WWF soap opera? Perhaps. But there’s a lesson here: be wary of somebody who assumes for themselves the title of People’s Anything. Such an honorific, if it’s to mean anything at all, needs to come from the People themselves. I have always maintained that in the hierarchy of the Rock’s signature moves, the People’s Elbow takes precedence over the Rock Bottom. The legality of foreign objects (e.g. chairs, baseball bats, 2x4s) was fluid. This was written by Bobo. Posted on Friday, October 24, 2014, at 1:28 pm. Filed under Business, Sports, Television. Bookmark the permalink. Follow comments here with the RSS feed. Post a comment or leave a trackback.